I don't personally drink Vodka but I do like to enjoy nice cool drinks and the copper mugs really keep my drinks cold for a longer amount of time. When these cups wear out or even if they don't they make great vases, and planters. Really gives your decor that extra kick. This cup comes with a ebook for recipes to enjoy some drink recipes. 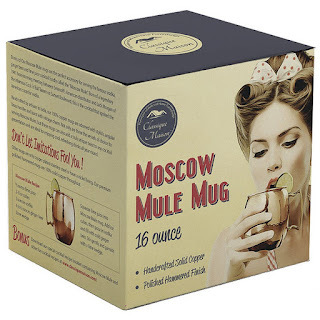 You can purchase the Classique Maison Mule Mug on Amazon. What Classique Maison has to say about their product. Our ultra stylish mug offers you a modern look with an ancient feel. angular brass handle and bursts with vintage charm. 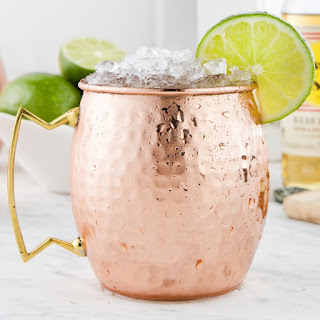 Not only is this the vessel of choice for serving Moscow Mules, but this mug can also add a truly unique twist to any cocktail presentation and is ideal for enjoying cool, refreshing drinks all year round! FEEL LIKE A KING OR QUEEN WITH THIS MUG IN YOUR HAND! 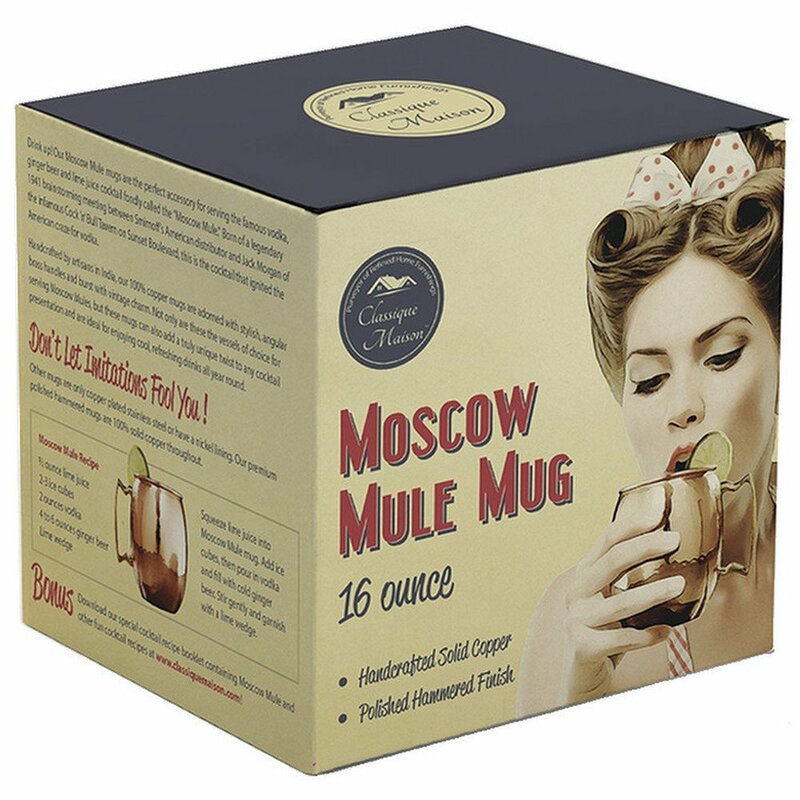 This eye-catching, 16 ounce, authentic Moscow Mule mug is 100% solid copper throughout, not stainless steel or nickel. Our Moscow Mule copper cups feature a beautifully hammered finish with a tarnish resistant, food-safe lacquer coating both on the inside and outside of the mug to protect its natural beauty and luster for years to come. OUR MOSCOW MULE COPPER MUGS KEEP ANY DRINK ICY COLD FOR A SURPRISINGLY LONG TIME. Perfect for any cocktail, iced tea, soda, water and any other cold drink! Keep this mug in the freezer so you are ready for an impressively cold, refreshing drink anytime! Our Moscow Mule mugs feature a brass handle that does not transfer heat from your hand to the mug. SUPER EASY TO CLEAN AND TAKE CARE OF. Hand wash with warm water and liquid dish soap. Towel dry with a soft cloth and you're done! It's that quick and easy. DON'T LET IMITATIONS FOOL YOU. Other mugs are simply copper plated stainless steel or have a nickel interior. Our premium polished hammered mug is 100% solid copper throughout. Hand wash with warm water and liquid dish soap. Towel dry with a soft cloth and you're done! To keep these mugs beautiful for years to come, we recommend not soaking them in water or placing them in the dishwasher. Disclosure: MarksvilleandMe received one or more of the products mentioned above as part of a promotion with Tomoson and Classique Maison. Regardless, MarksvilleandMe only recommends products or services we use personally and believe will be good for our readers. Some of the links in the article may be “affiliate links.” This means if you click on the link and purchase the item, I will receive compensation. If you would like MarksvilleandMe to review a product or service please contact us at marksvilleandme@gmail.com.